Take an up-close look at our gutter guards! MasterShield Gutter Guards know the problems our clients face with clogged gutters. Nobody has the time or energy climb ladders and clean your gutters, and most homes in the DMV area are tall and difficult to clean anyway. Local flora build up in your gutters fast, and other gutter guard systems aren't up to the challenge – they either still get clogged or they break apart. We are the exclusive dealers of MasterShield Gutter Guards. This award- winning technology is patent-protected and has been installed in thousands of homes. MasterShield Gutter Protection has also been the choice gutter protection on the market by local and national organizations such as Ask the Builder and Extreme Makeover: Home Edition. If you take care of your gutters now, you'll thank yourself later. Get a free quote from MasterShield Gutter Guards today in Virginia, Maryland, and Washington, DC! Maria K. called us to address the water overflow issue with her current gutter system. When we went out to examine the gutter system we found she was getting water along the side of her home as well as behind the gutters, creating rot on the fascia boards. We removed the old system, replaced the damaged fascia. and installed a MasterShield gutter system. She will no longer have overflow issues and the fascia board is now protected. The gutters on this cottage home in Alexandria, VA. were clogged so bad trees were growing out of them. We installed new bigger gutters (6 inches) and MasterShield gutter protection. They will now NEVER have to clean their gutters again. MasterShield® is pitched or sloped like your roof, so debris can actually shed. Other gutter guards sit to flat and just create a shelf where debris sits and clogs the filter. MasterShield® is the only self-cleaning system. 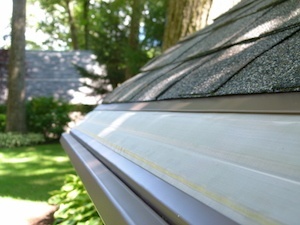 If you buy an inferior gutter guard, they still need to be cleaned and maintained. What a waste! MasterShield® is built out of a heavy-gauge aluminum frame with a 316 marine grade stainless steel microfilter. Plastic-framed products will warp – go with the best! MasterShield® can take all the water your roof can throw at it. MasterShield® is engineered with marine-grade stainless steel. Of all the available grades of stainless steel, none are more suited to resist the corrosive environment of your roof. MasterShield® is a super fine mesh filter, woven so tightly that not even a grain of sand can get through – let alone fir, pine needles, or other plants and flowers. MasterShield® uses copper to prevent moss growth, thin asphalt shingle oils, and kill bacteria. Do not be fooled by imitators or cheap, big store want-to-be products. Gutters and gutter protection are not homeowner projects – get off the ladder and hire a professional! Why wait until it's too late? Don't ignore failing or clogged gutters – let us show you the best gutter guard protection system on the market today and then you decide for yourself. Our family run business focuses on quality products and first class installation, and we want you to feel confident in your decision. Ready to get started? Call us at 1-844-385-9370 or contact us online to schedule a free estimate! We serve customers in Manassas, Woodbridge, Alexandria, Springfield, Centreville, Reston, Annandale, Sterling, Chantilly, Burke, and throughout the surrounding cities and towns.